In the run-up to the presidential and legislative elections of April-June 2012, this blog will look at some of the most interesting departments, profiling their political preferences, past and present. The second department to be profiled is the Vendée. The name Vendée is due to mean something to almost all students of French history and society. In history, the name Vendée is intricately connected with the counter-revolutionary conservative, monarchist and clerical chouannerie (1794-1800). To contemporaries, the Vendée can evoke the image of a backwoods rural, mystical and very conservative bulwark. The man which has represented the Vendée in the French political arena, Philippe de Villiers, has conformed to this stereotype and broad image of his department. Once again, the reality is not that simple. The Vendée is not a cohesive bloc and the nature of its conservatism is often misunderstood or misinterpreted. Traditionally, the Vendée can be divided into three broad regions. Entering the Vendée from the Charentes, one meets the marais poitevin, a large area of marshland which covers the far south of the Vendée (Luçon, Chaillé-les-Marais), northern Charente-Maritime (Marans) and parts of the Deux-Sèvres (Niort). The area in its two thirds is now composed of dried marsh largely used for agriculture, while a third of the marsh remains a wet marsh noted for its canals and maze of islets. Moving further north, one enters the plaine poitevine (or plaine vendéene), often referred to simply as ‘the plain’. The plaine is an exceptionally flat openfield region, devoid of trees and hedges. The cereal and wheat plains of the plaine resemble those of the Beauce in Eure-et-Loir more than they do their immediate neighbor to the north. The two-thirds of the Vendée are covered by le bocage vendéen, which is the department’s most well-known region and the region from which the political and social stereotypes stem from. More hilly, but not mountainous (the highest peaks are roughly 290m), the bocage’s landscape is famous for its mystical maze of fields divided by hedges and isolated from main roads. André Siegfried described the bocage as a rugged, charming landscape breaking the monotonous plains, a mysterious region of trees, high edges and hidden lanes hiding houses and farms. In another stark contrast to the cereal fields of the plain, the bocage is largely a land of breeding and grazing (élevage) of granivorous and herbivorous animals. The bocage can be treated be as a homogeneous ensemble for our non-geographic purposes, but it is still worthwhile to point out its two main regions and the non-bocage islands within the northern two-thirds of the Vendée. The bocage is subdivided into the more hilly and even more mystical haut bocage in northeastern Vendée (Montaigu, Les Herbiers, Mortagne) and the flatter bas bocage. The bocage does not cover the entirety of the department. In the northwest confines of the department on the border with Loire-Atlantique, the marais breton, which is Breton in name only, is a dried marshland similar to the marais poitevin. The island of Noirmoutier, whose landscape resembles that of the plain, is often attached to this region. A smaller marshland exists around Les Sables-d’Olonne. Around Chantonnay, surrounded by the bocage on all sides, the flatter and fairly tree-less fields of the plains can be found at a smaller scale, forming what can be called the limestone island of Chantonnay. Limestone because these three geographic regions form three geological regions. The marais poitevin is a quaternary region (terrain quarternaire), the plains a jurassic limestone (calcaire) while the bocage forms the southern reaches of the much wider Armorican Massif (massif armoricain), which covers all of Brittany and most of the inner inland west. The massif armoricain‘s dominant rock is granite, as opposed to the limestone of the plains. The border between the plain and bocage is often defined as part of the boundary between western France and the rest of France. Two other regions can be added to our overview of the Vendée’s geography in a political context: the coast and the region of La-Roche-sur-Yon. The coastal region forms a fairly cohesive bloc nowadays, and politically it is important to differentiate it from both the bocage and the plains-marshland. A region of sand dunes and sunny beaches, the Vendéan coast is nicknamed the ‘Côte de Lumière’. The island of Noirmoutier but also L’Île-d’Yeu, 25km off the coast, are often included in the coastal region. Finally, in a day and age where true rural areas are few and far between, it is important to differentiate the Vendée’s political capital, La-Roche-sur-Yon from its neighbors in the bocage. An artificial city built from scratch by Napoléon, its political impact has been fairly minimal in the past, but for our purposes, we must insist on the place of the city but also its suburban belt, which forms a circle all around it, extending south to the border with the plains, north to the confines of the departments and east to Les Essarts. The Vendée has been represented by five deputies since 1986, and its constituencies were not altered by the Marleix redistricting of 2009, meaning that the Vendée will continue to use the Pasqua redistricting of 1986. The Vendée has been redistricted only thrice since Napoleon III was defeated at Sedan: in 1875, in 1958 and in 1986! Between 1875 and 1958, the Vendée returned six deputies (two deputies apiece from the three arrondissements of La Roche, Les Sables and Fontenay-le-Comte) but this fell to only four deputies between 1958 and 1986. The Vendée’s constituencies in terms of their coherency and homogeneity are a mix of good and bad. Charles Pasqua drew up a coherent coastal constituency (the third constituency) which the two insular cantons and the coast as far south as Les Sables. The coast, as mentioned above, forms a cohesive political and economic bloc and splitting the coast into two or more constituencies would hardly have made sense. That was the way it was in 1958 as well. Of course, from the right’s perspective, keeping the coast together was not something which was tough to do: it was politically advantageous to build such a constituency. In the northeast, the fourth constituency, is also fairly coherent, centered in the haut bocage and its surroundings. Similar comments can more hardly be made, however, for the first and second constituencies. In the purest French tradition, and remiscient of Saskatoon and Regina in Canada, the current map splits the city of La-Roche-sur-Yon’s two overpopulated cantons into two different constituencies. The northern canton joins Challans, Les Essarts, Palluau, Le Poiré-sur-Vie and Rocheservière while the south joins Chantonnay, Mareuil-sur-Lay-Dissais, La Mothe-Achard, Moutiers-les-Mauxfaits and Talmont-Saint-Hilaire. Splitting these cities is not indispensable; a more coherent constituency, both socially and economically, could be created by reuniting the city and adjoining suburban cantons to such a seat. It could end up a bit oversized, but that’s largely because the two urban cantons are oversized. Of course, a coherent urban constituency both in 1986 and 2009 would have run contrary to the right’s political desires. The Vendée has returned a delegation dominated entirely by the right in every legislative election since 1993. The Vendée has three senators, who were last elected in 2004. The Vendée has never elected a PS Senator in its history and all three senate seats are held by the right. The Vendée’s general council has 31 members, renewed by halves every four years up till this point. The right has governed the general council with an overwhelming majority since the Liberation, and while it has been governed by republicans, the Vendée’s general council – as far as I am aware – has never been led by the left. The right currently holds 26 seats to the left’s 5 seats, which is roughly where the left’s ceiling has stood since the 1990s. The general council is overwhelmingly dominated by divers droite members (DVD), right-wing independents, largely rural-based, who hold 19 seats against only 1 for the UMP and 4 for the MPF. The president of the general council since 2010 is Senator Bruno Retailleau (DVD). The Vendée’s 31 cantons exhibit an acute case of malapportionment. La Roche-sur-Yon is divided into two cantons (Nord and Sud) which also include neighboring suburban communities. The Nord canton has a population of 44,943 – about 25,000 over the theoretical ideal number of 20,000 – while the Sud canton has 33,944. Other cantons also exhibit such malapportionment: the canton of Les Sables-d’Olonne has a population of 47,026, Saint-Gilles-Croix-de-Vie has 44,383 and Montaigu has 31,735. On the other hand, a handful of rural cantons are massively underpopulated: 4,699 in L’Île-d’Yeu, 8,531 in Chaillé-les-Marais or 8,501 in Sainte-Hermine. Besides the division of La Roche into two cantons sometime in the past, the cantonal map of the Vendée in 2012 is identical to that of 1912. The Vendée has 17 seats in the regional council of the Pays de la Loire, which is governed by a Vendéen, Jacques Auxiette (PS). 10 seats are held by the left, split between 6 PS, 2 EELV, 1 PRG and 1 ecologist. 7 seats are held by the right, split between 3 UMP, 3 MPF and 1 NC. The Vendée is a right-wing stronghold at all levels of government. In 2007, Nicolas Sarkozy (UMP) won 57.06% of the vote against 42.94% for Ségolène Royal (PS), making the Vendée 4% more right-wing than nationally. The fourth constituency (60%) and the third constituency (62%) often tend to be the most right-leaning constituencies. No left-wing presidential candidate has won a majority of the votes in the Vendée. François Mitterrand (PS) came closest to doing that in his 1988 landslide re-election, when he took 46.06% to Jacques Chirac’s 53.94%. This gives the impression of a long-time right-wing stronghold, but when we expand our analysis to presidential elections since 1965, we find that the Vendée has trended sharply towards the left since 1965. In 1965, when Charles de Gaulle won 71.15% of the vote in the Vendée, the department was 16.65% more right-wing than France. In 1974, it was 16.27% more right-wing and in 1988 it was only 7.92% more right-wing. The major shift took place between 1995 and 2007. Chirac won 60.5% of the votes in the Vendée in 1995, 7.82% more than his national result. On April 22, 2007; the Vendée gave Sarkozy 29.7% of the vote, less than the 31.18% he won nationally. An underperformance due, of course, to the native-son candidacy of Philippe de Villiers (MPF) who placed fourth with 11.28% (he won 2%) nationally, a result far below that which he won in his first presidential candidacy in 1995, when he won his home department with some 22% of the vote. Royal won 21.7%, against 25.9% nationally. François Bayrou (UDF) outperformed his national average in the Vendée, with 20.77% of the vote against 18.6% nationally. Jean-Marie Le Pen won only 6.46%, below his 10.4% nationally. In 2002, Jacques Chirac won the Vendée with 24.9% against 14.8% for Lionel Jospin and 11.8% for Jean-Marie Le Pen. In 1995, it was de Villiers who won the Vendée with 22%, with Edouard Balladur placing second with 20.2%. Chirac won 18.2%, placing fourth behind Jospin (19.5%). In European elections, the Vendée stands out the most from the rest of France, having voted for right-wing lists supported or led by Philippe de Villiers in all Euros since 1994. Even in 2009, when de Villiers’ MPF-CPNT lists performed poorly nationally, he won 33% of the vote against 22.5% for the UMP. The PS placed a distant third with 12.8%, against 11.9% for their Green rivals. In the 2010 regional elections, the UMP won 37.8% (against 32.8% in the region) against 34.9% (against 34.4% in the region) for the PS in the first round. The EELV list, with 10.6%, underperformed its regional showing of 13.6%. The FN list, with 6.8%, also underperformed its regional average (7%) as did a PG-PCF list which won only 3.55% against 5% in the region. In the runoff, the left won 50.29% to the right’s 49.71%; while in the region as a whole the left was victorious with 56.39% of the votes. The Vendée’s political inclination can still be summarized as being heavily right-wing, with a strong base for its favourite son’s party, the MPF. However, the left has tended to break into the right’s historical hegemony at all levels. Yet, treating the Vendée as an homogeneous entity is still incorrect. Voting patterns in the Vendée are pretty heavily regionally-based, with our aforementioned geographic regions often carrying a pretty clear and consistent political orientation, which in some cases has hardly changed since the days of André Siegfried, whose political description of the Vendée and the rest of western France in 1913 remains one of the greatest books ever written about elections and political behaviour in France. The Vendée straddles the border of western France and the rest of France. This border is formed by the line dividing the plaine from the bocage, a line which is not only an artificial man-made border which in the end means little on the ground but is a crucial line which divided, in the past at least, two worlds. We touched on some of the distinctions between these two geographic regions of the Vendée in our geographic overview of the department. From a political standpoint, there are a number of additional distinctions to make about this line which divides these two regions. The line acts a natural boundary for three main socio-political or demographic factors: type of settlement, form of agriculture and religiosity. The divide, which is of course also a geological divide, separates nucleated population from dispersed population. The population of the marais and the openfield plain have traditionally been nucleated, in that the bulk of the commune’s population lived in a cohesive village and not dispersed throughout the commune’s legal boundaries. On the other hand, the bocage is very much a country of dispersed settlement. Our description of the bocage’s landscape above, as being a mystical-like maze of hedges, lanes and isolated farms, should make this seem obvious. Dispersed populations tend to live all over the commune, concentrated in tiny groupings of 3-5 farmhouses on an isolated lane or road while comparatively few people live in the commune’s main town. While speaking in such terms in this day and age, when the bulk of population is just ‘urban’ in a way or another, is anachronistic and archaic; the effects of historical settlement patterns in forming political traditions should not be underrated. Nucleated settlements, with communal life were much concentrated into a village life, made social interactions easier and far more common. The nucleated populations were more open to new political ideas, such as republicanism or socialism, and also more resistant towards hierarchical institutions including nobility or the church. On the other hand, dispersed populations seldom had the chance to congregate and the natural isolation of habitats made such congregations difficult. In turn, newfangled political ideas faced a much tougher crowd, one which was individualistic but also far more loyal to traditional social actors including nobility or the church. The second main divide between the two Vendées is found in the form of agriculture (le mode de faire-valoir agricole). The cereal-growing openfields of the plain has historically been a land of smallholdings, where individual farmers owned and worked their land. Of course, agriculture is no longer the employer it was a hundred years ago and the remnants of agriculture have been mechanized or concentrated into larger farms. The social relations which agriculture used to breed a hundred years ago are no longer relevant in regions such as western France. But, again, we should not underestimate the importance of these traditions in forming political traditions which have survived to this day. On the other hand, the bocage was very much a country of grande propriété: large properties owned by a single individual or nuclear family, traditionally a noble or aristocrat. However, the bocage was at the same time a land of big property and petite exploitation indirecte which meant that while a rich noble owned the bulk of the land in a commune, he did not work his land himself and instead delegated that task to sharecroppers or farmers who worked their own tiny parcel under contract with the landowner. Thus, the bocage is a land of sharecroppers, farm workers and tenant farmers. In 1942, faire-valoir direct (often smallholders or at least those who owned and worker their land) represented only 30% of the land in the Vendée, the third lowest in France (tied with the Nord). Tenant farming (fermage) represented 44% and sharecropping (métayage) represented 26% of the land. What can be the political and social implications of such an economic setup? André Siegfried defined the political regime of the bocage as a hierarchy in 1912. Sharecroppers and tenant farmers, timid and respectful of established hierarchy, lived in fear or at least apprehension of the landowner who, despite the patriarchal twist which their relations naturally took, could still evict a sharecropper or farmer or not renew a lease. In the bocage, the old nobility of the Ancien Régime remained socially, economically and politically predominant well into the twentieth century. However, Siegfried distinguished the Vendéan aristocracy from that of Anjou. The nobility of the bocage, Siegfried wrote, was rougher in its manners, lifestyle and culture. He wrote that there were amongst its members “plenty of boorish types, drinkers and gamblers; and especially a lot of mediocrity”. But at the same time, Siegfried noted that despite this, the aristocracy was local, rural and prestigious. Traditions of hierarchy and respect for authority made them respected figures of authority. The third factor, and one which is still relevant to this day and age, is that of religiosity. The role of religiosity in shaping one’s political behaviour in France need not be emphasized. The divide between the plain and bocage is also one of religiosity. Nucleated populations were more resistant to the hierarchy of the Catholic Church. Thus, the plaine poitevine became an anti-clerical region, resistant of the church and the hierarchy which it entailed until the 1960s. 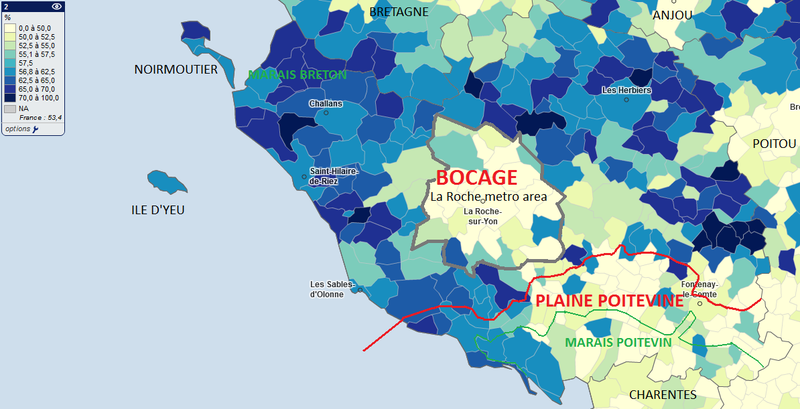 On the other hand, the bocage is one of the most clerical regions of France. The Catholic Church remained a dominant social and political actor well into the 1950s and 1960s in the Vendée and the influence of Catholicism (clericalism) can still be felt to this day in the bocage. The chouannerie of 1793 was very much led by the clergy rather than the aristocracy. Siegfried noted that in contrast to the Anjou, the clergy was the dominant social and political actor over the aristocracy. The priest in the Vendée commanded tremendous political influence and authority. His word, united to that of the aristocrat, carried a great meaning and was always ensured a receptive audience. Siegfried cited fear, respectful affection, habit and devotion as the main factors in explaining the attachment of the Vendée to its priests and clergy. In 1912, the alliance of “church and castle” was far more powerful than whatever republican institutions existed on the ground, the high attendance rates of private schools is but one proof of this. While the remnants of French aristocracy only serve to provide fodder for Point de Vue in this day and age, the church maintained its direct conservative political influence over the Vendée until the 1950s or 1960s. While society has been extensively secularized and fundamentally transformed, it is undeniable that such a clerical tradition has shaped political opinions even in 2012 in a significant way. What remains of the republican traditions of the plain and the marais? Using the above map showing the vote for Nicolas Sarkozy in the 2007 runoff divided by commune, we can see that, outside of the coastal region, the plain and marais have retained their left-wing traditions. Only a handful of communes in the inland regions of the plain and marais gave Sarkozy a result similar to or above his departmental average (57%). The old republican stronghold of Fontenay-le-Comte gave him only 50.6% of the vote, and Royal won Saint-Hilaire-des-Loges with 54.4%. At a municipal level, Fontenay-le-Comte was the preserve of Gaullist deputy André Forens, who served as mayor between 1965 and 1981 and again between 1989 and 1995. Since 1995, however, the left has held the mayor’s office, first in the person of Jean-Claude Remaud (PRG, ex-PS) who was badly defeated by a PS candidate in 2008. At a more macro cantonal level, Chaillé-les-Marais, located entirely in the marais, has almost always been the most left-wing canton. It is the only canton where the PCF was truly a potent political force for quite some time and it was won by Lionel Jospin even in the 2002 rout. Nicolas Sarkozy took 48.8% of the vote in the canton. He also lost neighboring Maillezais, a mixed plaine-marais canton, with 49.7% of the vote. He won 50.6% of the vote in the canton of Saint-Hilaire-des-Loges, 50.9% in the canton of Fontenay-le-Comte, 50.6% in Sainte-Hermine (mixed plaine-bocage), 51.8% in Mareuil (mixed) and 54.1% in Luçon (mixed plaine-marais-coastal). In 1912, these cantons had all been defined by Siegfried as strongly left-leaning (which meant something different in 1912). The marais, a Bonapartist stronghold until the 1880s, transformed into a left-wing, anti-clerical republican stronghold similar to other “left-wing Bonapartist” regions such as the Charentes but unlike “conservative Bonaparist” regions such as Normandy. Siegfried noted that from its Bonapartist days, the marais had retained an appetite for populism and ‘la manière forte‘ (‘the hard way’, in a non-authoritarian way) which went a bit against the desires of the rule-bound parliamentary opportunist republicans of the era. It would be interesting to speculate about the veracity of Siegfried’s description of the attitude, and explore whether it might explain why places like Chaillé-les-Marais flirted more than once with the PCF and later carried some attachment to Gaullism. The plaine, as Siegfried described it, a region of smallholders attached to their private property, was not particularly inclined towards Marxism or socialism in its pure form. Indeed, the plaine was long a Radical stronghold and only developed a strong attachment with the SFIO and PS at the point where French socialism replaced the Radicals in the old radical strongholds in both style and substance. The Vendée’s gradual trend to the left since the 1970s has not come primarily from the old left-wing regions of the plains or the marais. Indeed, in most of the old republican bastions of the Vendée, Nicolas Sarkozy either performed as well as, slightly better or just slightly poorer than Jacques Chirac had in 1995 – when Chirac won 60% to Sarkozy’s 57% in the department. Chirac won 52% in Fontenay-le-Comte (city) and 46.3% in Saint-Hilaire-des-Loges (city). The bocage, on the other hand, has retained its conservative political inclinations. However, the scope of the bocage has been diminished by major socio-demographic changes in what used to be a politically homogeneous region. The bocage, in its traditional sense as a rural or semi-rural region, has been shrunk to the confines of the haut-bocage, traditionally the most conservative part of the bocage and an embodiment of what Siegfried had called a “mystical” region of mazes, small roads and hamlets hidden behind hedges. While the bocage is no longer as Siegfried described it one hundred years ago: agriculture barely has a presence, and it has become far more urbanized and far less isolated than it used to be. It is also a fairly working-class region: the percentage of ouvriers (manual workers) is 36% in Montaigu, 37.8% in Mortagne, 44.6% in Saint-Fulgent, 40.2% in Les Herbiers, 42.9% in Pouzauges and 41.2% in La Châtaigneraie. I do not know much about the type of ouvriers this would encompass, but most of ‘rural France’ nowadays has similarly high percentage of manual workers, employed in low-paying jobs in small towns, small industries and small businesses. However, the bocage has always remained a devoutly Catholic region. The church no longer has any direct political influence (though it did as late as the 1960s or 1970s), but centuries of attachment to the conservative teachings and traditions of the church, the traditions of hierarchy and respect for authority and general social conservatism bred by the church certainly still carries a major influence. Few observers care to admit it these days, but to this day, in a good number of regions, a clerical tradition trumps a working-class tradition when the two coincide. The marais breton, if geology was to be a faultless indicator of political inclination, should lean to the left like the marais poitevin. But geology is nothing more than a coincidental indicator of voting patterns. The marais breton is indeed not identical to the bocage. The land structure was, when such stuff mattered, far more divided and home to a coincidence of small property and larger property. But in other aspects it is closer to the bocage: the habitat is fairly dispersed, and it has always been a clerical Catholic region. It has always been a traditionally right-wing region. Nicolas Sarkozy won his best results in the bocage. He took over 60% of the vote in a good numbers in the bocage, performing best (65.1%) in the canton of La Châtaigneraie, and also won 64% in Saint-Fulgent, 61.4% in Mortagne, 60.5% in Les Herbiers and 60.4% in Rocheservière. He also won 59% in Pouzauges and 56.8% in Montaigu. In the marais breton, he took 62% in Palluau, 61.7% in Challans and 63% in Beauvoir-sur-Mer. However, Nicolas Sarkozy’s performance in the bocage was far less impressive than that of other right-wing presidential candidates in the past. Case in point, Jacques Chirac’s impressive performance in the bocage in 1995. He won 70.1% of the vote in the fourth constituency (Montaigu), which covers the heart of the bocage and is traditionally one of the most conservative constituencies in France (it was represented by Philippe de Villiers for years). In 2007, Nicolas Sarkozy won only 59.96% of the vote. Ségolène Royal did about 10 percentage points better than Jospin in 1995, but far more impressive was that she even did better than François Mitterrand in 1988: 40% to 36.7% for Mitterrand in 1988 (in the whole of France, she performed about 8 percentage points lower than Mitterrand). Cantonal results are not available for 1995, but at the communal level, to name just a few examples and draw comparisons to 1995: Chirac won 60.9% in Montaigu (commune), Sarkozy got 55%. Chirac won 70% in Les Herbiers (commune), Sarkozy took only 59.6%. Chirac won 63% in Mortagne, Sarkozy won only 53.9%. These are only a few examples in the larger urban areas, Sarkozy’s under-performance was even more pronounced in more rural areas. He was often down 10% or more from Chirac’s 1995 performance, which in many cases broke 70%, 75% or 80% of the vote. Nicolas Sarkozy did not do as poorly in the marais breton, where demographic changes are more favourable to the right. Part of this pretty dramatic under-performance might be the result of poorer vote transfers from Philippe de Villiers’ vote to Sarkozy in 2007 than to Chirac in 1995 (this is the region where de Villiers had done best). Indeed, in Philippe de Villiers’ native commune of Boulogne (which he won in both years in the first round), Chirac won 77.2% of the vote in 1995 and Sarkozy only 55.9% in 2007. It is a bit harder to explain why Philippe de Villiers’ core electorate would have been drawn more to Chirac than to Sarkozy, given that both of those campaigns were fairly populist and not too big on the whole ‘federal Europe’ aspect which was more the affair of Balladur and Bayrou in 1995 and 2007 respectively. On the other hand, Nicolas Sarkozy likely ate up a lot of de Villiers’ 1995 electorate by the first round and what was left of Philippe de Villiers’ electorate in 2007 was far more resistant to Sarkozy, which they could logically perceive as a liberal pro-European right-winger (which was indeed Sarkozy’s image prior to 2002-2007). Demographic changes local to the region may also explain some of this shift to the left. Besides the suburban growth of La Roche-sur-Yon, which we will discuss later, there has been some fairly strong population growth in most of the haut-bocage in the first years of the twenty-first century, likely linked to suburban/exurban growth from Nantes-Clisson and Cholet. The 1999-2008 decade saw fairly robust population growth in most of the bocage, a change from earlier decades when the rural population in the Vendée often declined. However, another explanation is one which can be generalized to other similarly Catholic regions of France (especially neighboring Bretagne and Anjou). Voters of “Catholic tradition” – which we can define as less clerical, less practicing in these days but still influenced by a Catholic upbringing, environment and political tradition – have shifted pretty dramatically to the left in recent years (though it is a long-term process, begun in the 1980s). In the 1960s and 1970s, the bulk of the “Catholic” vote (practicing + tradition) was solidly right-wing, in part out of the fear of the atheist “Reds”. When the experience of the left in power in 1980s broke those old reflexes and fears of baby-eating communists, those voters gradually shifted to the left. After all, despite all that has been said about the Catholic Church being reactionary and so forth, the Catholic tradition often went hand-in-hand with pro-European views (in part, likely, because of the idea of ‘Europe as a Christian project’, which is not uniquely French) and more centrist views on economic matters and social policy; closer to the Christian democratic MRP tradition of the “third-way” between liberalism and socialism than to the right’s traditional liberalism. There is also the very important matter, of course, that few people still go to church on a regular basis (and those who do are as strongly right-wing as ever). Church-attendance has dwindled almost everywhere in France since 1960s. In the 1960s, we defined “church-going” as those who went to church weekly. Today, we often define “church-going” as those who go to church monthly. As voters become less drawn to the church and its conservative inclinations, it is fairly natural that they would be more left-wing than in the past or than their parents ever were. The most important socio-demographic evolution in the bocage is urban growth around La Roche-sur-Yon. La Roche-sur-Yon, the administrative centre of the Vendée, is a new city by European standards (200 years old) because it was an artificial creation of Napoleon. It was, for many years, as if somebody had dropped a bunch of buildings in the middle of the countryside without anybody in the countryside noticing it. It attracted, during the republican era, the government employees which formed the backbone of the republic throughout France, but the city was never a capital for the “real Vendée” (to speak like Sarah Palin). The aristocracy and the rural bourgeoisie, if it was drawn to a urban area, was drawn to Nantes, which in those years was the urban preserve of the rural aristocracy. La Roche was shunned as a republican creation, and until the 1950s-1960s, La Roche remained a fairly small urban centre (24k inhabitants in 1962) and its political impact on the surrounding region was minimal. Since the 1960s, however, La Roche has seen major demographic growth. In 1968, following a merger with two communes, the city had a population of 36k. In 2009, it had a population of 52.2k. La Roche is similar to other cities in western France: a fairly white-collar, middle-class city with a large population of employees or middle-level managers or public servants, what we can call classes moyennes salariées (salaried middle-classes, which can encompass teachers, nurses, sales representatives, supervisors and so on). The population tends to be younger and more educated than the national average. La Roche itself has always been a republican stronghold. The right has rarely governed the city, though the RI deputy Paul Caillaud was mayor between 1961 and 1977. Since 1977, the city has been a left-wing stronghold. Jacques Auxiette, the current PS president of the regional council, was mayor between 1977 and 2004, and since 2004 by Pierre Regnault (PS), reelected in 2008 with 50.1% of the vote by the first round. In 1995, Lionel Jospin took 53.4% of the vote, Royal won 58.4%. However, the novelty here is that La Roche now has a pretty clear zone of suburban influence. Growth in suburban communities has been strong since the 1960s, and the extent of La Roche’s suburban circle continues to expand. The city’s suburban communities largely resemble the original core: middle-class, salaried employees, some public servants and an increasing number of young families (which is one of the only thing in which it differs from the original urban core: there are far more single couples or singles in the city than in the suburbs). This is, in general, a trend which favours the left. Indeed, Lionel Jospin had won La Roche and a neighboring commune, but had lost (fairly narrowly) to Chirac in the suburbs. Royal, however, swept the suburbs. Jacques Chirac won 48.5% in La Ferrière, Sarkozy took 45.9%. In Mouilleron-le-Captif, the right declined from 53% to 49%. In Dompierre-sur-Yon, the right fell from 51.4% to 44.4%. In Venansault, Chirac won 58.3% but Sarkozy took only 49.5%. If you refer to the map of the Sarkozy vote in 2007 divided by region, you will quickly notice how the sub-50% performances by Sarkozy in the centre of the Vendée correspond quasi-perfectly to the La Roche-sur-Yon agglomeration. Sarkozy still won the more distant, exurban areas, but it would not be surprising to see him lose those areas in 2012 (even if he wins narrowly). Nicolas Sarkozy proved to be a poor candidate for these types of middle-class, “socially liberal” (to use an American term) urban and suburban areas. His populist appeal was tailored far more towards lower-income, working-class or exurban pavillons in eastern France which are far less socially liberal and drawn much more towards the far-right in part because of immigration issues. The lack of a large immigrant population in the Vendée, of course, explains why such a factor is not at work. This trend towards the left was not provoked by Sarkozy, but he was not a good candidate to limit or halt this trend. If you recall our division of the department into regions, I felt it necessary to separate the coast from the traditional regions of the marais, plaine and bocage. When Siegfried wrote about the Vendée (and indeed the rest of the coastal west), the coast was largely a region of fishermen, most of whom were republicans. You might still have fisherman today, but the vast majority of the Vendéan coast since the 1960s has been entirely changed by the growth of coastal resort towns (the stations balnéaires), through a process often referred to in French as baléarisation. The coastal region (the ‘Côte de Lumière’) saw major population growth, concentrated in regional clusters, since the late 1960s. The first wave touched the coastal communities between Les Sables-d’Olonne (which itself has been in decline since the 1960s) and Saint-Hilaire-de-Riez, the second wave expanded into the coastal communities south of Les Sables-d’Olonne near Talmont-Saint-Hilaire. The resulting situation is that the whole of the coast, from Noirmoutier to L’Aiguillon-sur-Mer is a giant tourist coast, which even extends north to reach the resorts around Pornic in Loire-Atlantique. What are the demographic results of such a phenomenon? Firstly, a very old population. Those aged above 60 can make up to 40% of the population in most of the coastal communities. Insee’s indice de vieillissement (not the median age, but a ratio between those 60+ and those 20-) gives very high numbers (the higher the number, the larger the proportion of 60+ residents vis-a-vis 20- residents) along most of the coast: 78.5 in Les Sables, 67.2 in Saint-Hilaire-de-Riez, 53.7 in Talmont-Saint-Hilaire, 63.7 in Saint-Jean-de-Monts, 73.3 in Saint-Gilles-Croix-de-Vie, 82.4 in Jard-sur-Mer and 78.4 in L’Aiguillon-sur-Mer. Retirees often make up an absolute majority or a large plurality of residents along the coast. Secondly, a very big proportion of second homes (résidences secondaires) which indicates homes used for vacations, week-ends or other touristic purposes. Along the coast, in some of the smaller communes, they can often make up some 55-70% of the total number of the total number of houses. Thirdly, a generally affluent population, with median household incomes usually above 18,000 euros. It is certainly no secret that the growth of resort towns, stations balnéaires, in France, is very favourable to the right. The mix of a tourism-driven economy and an old population of affluent retirees who have moved to the coasts is a perfect recipe for a strong right-wing vote. Nicolas Sarkozy won 62% in Les Sables-d’Olonne, 66.9% in Bretignolles-sur-Mer, 61.6% in Saint-Gilles-Croix-de-Vie, 59.4% in Saint-Hilaire-de-Riez, 67.2% in Saint-Jean-de-Monts, 65.6% in Noirmoutier-en-l’Île, 62.6% in Talmont-Saint-Hilaire, 66.7% in Jard-sur-Mer, 64.6% La Tranche-sur-Mer, 63.4% in La-Faute-sur-Mer and 61.8% in L’Aiguillon-sur-Mer. Les Sables-d’Olonne at the municipal level is the impregnable stronghold of the Gaullist (RPR) deputy Louis Guédon, who has held the city’s reins with much ease since 1980. The right has governed since 1947. Nicolas Sarkozy performed slightly better (or equal to) Chirac in most of the resort towns. Using our same sample of towns, using 1995 results instead we find Chirac winning 60% in Les Sables-d’Olonne, 65.1% in Bretignolles-sur-Mer, 60.9% in Saint-Gilles-Croix-de-Vie, 55.8% in Saint-Hilaire-de-Riez, 66% in Saint-Jean-de-Monts, 63.2% in Noirmoutier-en-l’Île, 60% in Talmont-Saint-Hilaire, 57.3% in Jard-sur-Mer, 65% La Tranche-sur-Mer, 60.3% in La-Faute-sur-Mer and 60.2% in L’Aiguillon-sur-Mer. Nicolas Sarkozy was a fairly good candidate for resort towns, though Jacques Chirac was too. The Vendée’s attitude towards Europe as embodied by the 1992 Maastricht and 2005 TCE can be summarized as being “divided” but when you pause for a more detailed look, we find some rather interesting contrasts between the two votes. In 1992, the Vendée rejected Maastricht with 50.3% voting against. In 2005, the Vendée approved the TCE with 50.2% voting in favour. A result which further amuses when one considers that one of the biggest cheerleaders of the no in both years was Philippe de Villiers. In both referendums, 1992 and 2005, the Vendée voted for the option which lost nationally, and more impressively, was the only department to vote against Maastricht in 1992 but in favour of the TCE in 2005. I am one of those who subscribes to the view that both referendums were fought heavily along class lines. But this explanation cannot be everything, as the Vendée shows. 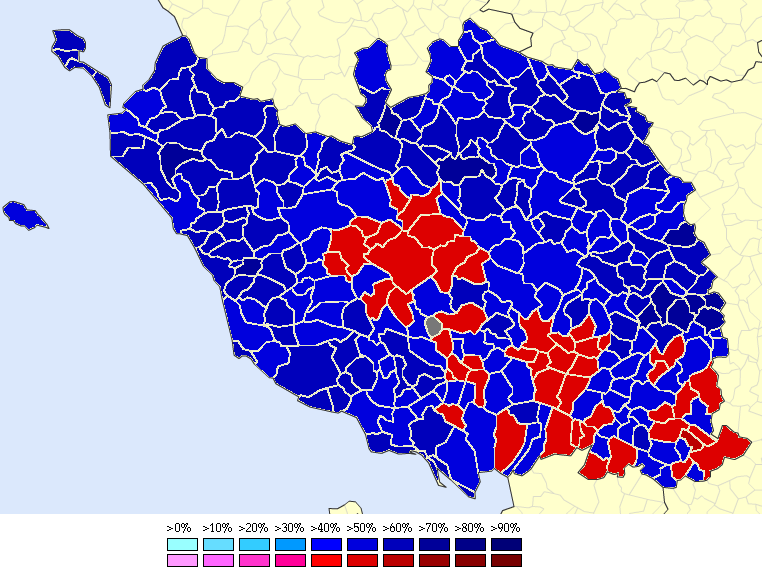 A side-by-side analysis of a map of the 1992 and 2005 results at a communal level reveals interesting contrasts between both years, with some communes switching allegiances in sync with the national mood (yes in 1992, no in 2005) but a good number also switching allegiances ‘out of sync’ with the French mood (no in 1992, yes in 2005). This also happened at a constituency level: the second constituency (Roche-Sud) voted in favour in 1992 (53%) but against in 2005 (50.4%). Likewise in the fifth constituency (Fontenay) which was in favour in 1992 (51.3%) but against (53.5%) in 2005. One constituency voted against in 1992 but in favour in 2005 – the fourth constituency (Montaigu) which was against in 1992 with 51.6% but in favour in 2005 with a full 55.7%. What is remarkable about the fourth constituency? It is one of the most right-wing constituencies east of Neuilly-sur-Seine, but it is also the former constituency of Philippe de Villiers. The communal map reveals the same patterns: the base of the yes vote shifted between 1992 and 2005, from a base largely concentrated in La Roche and Fontenay in 1992 to a base heavily concentrated in the haut-bocage in 2005. The coast and marais breton remained solid in their opposition, while La Roche-sur-Yon’s urban area remained consistently in favour. Why this shift, especially in the fourth constituency, which would have been expected to follow the opposition of its favourite son in 2005. In French referendums, some voters answer the question which is asked, but for a lot of voters, they answer the person who asked that question (usually they don’t give a pleasant answer to said person). This was the case in 2005, when the referendum also took the form of a protest vote against the Chirac-Raffarin governing duo; but in 1992, there was also a strong right-wing protest vote against the Mitterrand presidency (which was very unpopular by then). In the plaine in 1992, we find that the more left-wing areas around Fontenay voted in favour, but the solidly right-wing areas of the bocage from Montaigu down to La Châtaigneraie voted against. Philippe de Villiers likely played a role in boosting that opposition in 1992, given that the ultimate Villieriste stronghold – his birthplace (Boulogne) was more than 70% against. I would probably describe the opposition of the bocage in 1992 as falling into the second category – people who answer the person who asked the question rather than the question itself – given that Catholicism goes hand-in-hand with a pro-European vote. Something which 2005 proved, but which might have exaggerated given that right-wing voters felt no contradiction in voting yes to a “right-wing referendum” unlike voting yes to a “left-wing referendum” in 1992. The 2005 map shows a solid block of support in the most conservative parts of the bocage and haut-bocage in eastern Vendée, from Montaigu down to La Châtaigneraie and extending even into the villieriste strongholds in Les Essarts (but Boulogne voted against, though far less enthusiastically). The 2005 results were certainly quite a rebuke of the local favourite son, whose social conservatism might be well in sync with the Vendéan electorate but whose Euroscepticism is slightly out of place in a traditionally pro-European department. La Roche-sur-Yon remained consistent, more or less, in its support for Europe in both 1992 and 2005. The no vote was stronger in 2005, especially in the less affluent southern commuter belt communities, but remained strong in the urban core and the more affluent and middle-class professional northern commuter belt communities. In this case, demographics trumped partisan roots: urban-suburban salaried middle-classes, young and educated families and some public servants can be expected to be fairly pro-European. The coast and the marais breton were consistent, more or less, in their opposition on both years. In 2005, some resort towns such as Saint-Jean-de-Monts, Saint-Gilles-Croix-de-Vie, Les Sables-d’Olonne and La Tranche-sur-Mer switched from opposition in 1992 to support in 2005 (in this case, partisanship is likely the cause). Outside the major coastal centres (the ‘big’ resorts which draw most tourists), small resort towns or retirement communities have generally tended to be fairly Eurosceptic in both years. In terms of abstention, the Vendée is a fairly civic department. In 2007, abstention in the first round was 11.9% and 12.7% in the runoff (it was 16% nationally). In 2002, abstention was 24% in the first round against 28% nationally. As is usual, turnout is usually lower in large urban areas (86.5% in La Roche-sur-Yon in 2007), but also along the coast where the population fluctuates a lot and where voters are probably less politicized, less drawn to vote. Turnout was 84.8% in the canton of Les Sables in 2007, 84.8% in Challans or 85.7% in Saint-Jean-de-Monts. The two islands also have below-average turnout. Turnout is much higher in the more closely-knit small towns of the bocage, where the clerical tradition has also had its impact on boosting turnout. Turnout was 89.5% in Montaigu (canton), 89.9% in Saint-Fulgent, 89.6% in Le Poiré-sur-Vie and 89.3% in Rocheservière to name just a few examples. The left-wing plaine and marais usually have fairly average turnout, but sometimes they join the ranks of low turnout cantons. Philippe de Villiers is probably the most well-known Vendéan politician, and, as said above, he continues the stereotype of the Vendée as an ultra-conservative rural backwater which elects weirdos like l’agité du bocage. The Viscout Philippe de Villiers, who had served as secretary of state in the Chirac-II government between 1986 and 1987, was originally a member of the UDF’s liberal wing (the PR) before founding his political movement, Combat pour les valeurs in 1991 and the MPF in 1994. He served in the National Assembly for most years between 1987 and 2004, served as an MEP for various terms and since 2004, and most importantly he was the president of the general council of the Vendée between 1988 and 2010. Since his resignation from the departmental presidency, the fate of the MPF is uncertain. It still has two deputies, Véronique Besse (who replaced de Villiers in 2004) and Dominique Souchet (who won the seat held by Joël Sarlot in a 2008 by-election) and one Senator (Philippe Darniche) whose jobs are fairly solid, but it is left with only 5 general councillors and the only up-and-rising politician in the MPF, Bruno Retailleau (de Villiers’ former right-hand man), who is the current president of the general council, broke from the MPF after a bad spat with the Viscount following the latter’s veto to the former’s entrance into the Fillon cabinet. In the 2010 by-election to replace Philippe de Villiers in the canton of Montaigu, the MPF mayor of Montaigu, Antoine Chéreau, was surprisingly defeated by a DVD candidate. Outside the department, the MPF also finds itself with a very limited base: Philippe de Villiers’ alliance with the hunters and Declan Ganley in 2009 only saved his own seat in the EU Parliament, and the only major MPF base outside the Vendée (in Orange, Vaucluse with ex-FN deputy Jacques Bompard and his wife) is no more since Bompard left the party in 2010. Guillaume Peltier, Philippe de Villiers’ very own young rising star (another ex-FN element), realized that his star could rise more within the UMP than in the dwindling MPF. Before commenting on Philippe de Villiers and the MPF’s base in the Vendée, it is crucial to point out that there is a strong favourite son vote for Philippe de Villiers which gives the MPF results above its national average everywhere in the department. In 2007, Philippe de Villiers won only 11.3% of the vote, down from 22% in 1995. But at the level of Euro elections, the Vendée has been unique in that it has voted for the villieriste list in all EU elections since 1994 – even in 2009 it won 33% of the vote. At any rate, it is still worthwhile to break the favourite son vote down: where is it highest, where is it lowest? The core of the MPF electorate is in the bocage and haut-bocage, which is not only Philippe de Villiers’ constituency and homebase but also the most conservative region of the department. Philippe de Villiers is not reflective of the traditional Catholic electorate in France, given that his base is with the fairly small and unrepresentative sample of devout church-goers rather than those of “Catholic tradition” who are more likely to vote for the UDF. In 2007, he won 16.1% in the canton of Saint-Fulgent, 13.2% in his canton of Montaigu, 12.8% in his brother’s canton of Les Essarts, 12.6% in Les Herbiers, 14.9% in Pouzauges, 12.4% in Mortagne, 13.5% in La Châtaigneraie and 12.7% in Chantonnay. But the only commune he won in 2007 with some 22% was his birthplace of Boulogne, in Les Essarts. The MPF also performed well in the inland regions of the bocage to the east of La Roche and the marais breton. In 2007, Philippe de Villiers won 15.1% in Beauvoir-sur-Mer, 14.1% in Palluau, 13.1% in Challans, 12.7% in Saint-Jean-de-Monts and 12% in Talmont and La Mothe-Achard. He did poorly in Les Sables (9.4%) and in other wealthy resort communities. La Roche (only 5.3%) is very anti-villieriste as are its inner suburbs. The plaine and marais, especially the left-wing communes, are resistant to the MPF. In 2002, Christine Boutin’s support was rather reflective of the traditional MPF electorate. The FN has usually been fairly weak in the Vendée, which proves that rock-ribbed conservatism doesn’t necessarily equate itself with a strong FN vote. Jean-Marie Le Pen won 11.75% in the Vendée in 2002, against 16.9% nationally. In 2007, he won 6.5%, against 10.4% nationally. In 2010, the FN list took 6.8% of the vote. The 2002 results were probably boosted a bit by the absence of Philippe de Villiers’ name on the ballot, leading some of the most conservative MPF voters to vote for Le Pen – who did indeed win 15.5% in Boulogne! However, taking 2002 as a fairly typical example of a FN at its peak, Le Pen won his best showings along the coast. Using a cantonal level, he won 15.6% in Talmont, 15.5% in Saint-Jean-de-Monts, 15.1% in Beauvoir-sur-Mer, 15.1% in Saint-Gilles-Croix-de-Vie, 15% in both islands and 14.7% in Les Sables. His performances in the bocage, La Roche and around Fontenay were far less impressive, even by local standards. He won only 7.6% in the city of La Roche. Given that “the FN vote in the Vendée” is not the subject of much analysis, it is hard to describe in much detail what type of FN vote is found in the department, especially along the coast. Based on my “four worlds of FN voters”, described in depth here, I would be tempted to qualify the FN vote as something between a type 1/type 1-bis and type-2 vote, with perhaps an added element of an undescribed “bourgeois right-wing vote” which is a cyclical protest vote by conservative right-wingers against the right-wing government of the day (Chirac was hardly popular in 2002). Indeed, a type-1 classification would make some sense given that Le Pen’s vote share in the third constituency (the coast) fell by more than it did nationally in 2007 (one of the rare Atlantic coast constituencies to do so), indicating that Sarkozy won a good share of the FN voters in that region. 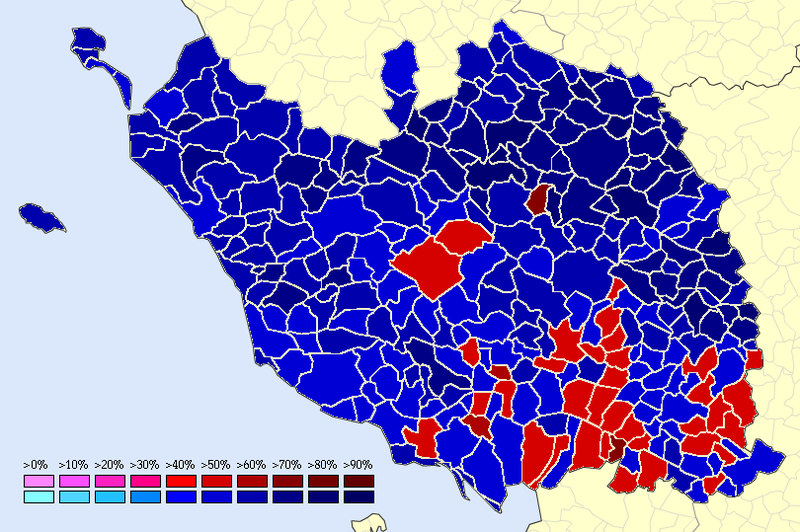 As a Catholic department, the Vendée denotes itself by an above average vote for centrist candidates or parties of centrist tradition (the UDF). Jean Lecanuet in 1965 won 24% in the department, placing second (ahead of Mitterrand) and above his national average (15.9%). In 1988, Raymond Barre won 24% against 16.5% nationally. Even in 1995, rivaled by a candidate with roots in the UDF (but in the liberal faction, the PR), Balladur won 20.2% against 18.5% nationally, and placed 2 percentage points behind de Villiers, who won the department. In 2002, François Bayrou won 8.4% against 6.8% nationally. In 2007, Bayrou took 20.8% against 18.6% despite a Villiers who took 11.3% in the department, concentrated in the regions where the UDF usually performed best. Bayrou’s electorate in 2007 was in some cases quite unlike the traditional UDF electorate, but in the Vendée his performance is rather typical of Christian democratic candidates. At a cantonal level, Bayrou’s cohesive base was in the haut-bocage. He won 26.5% in Mortagne, 27.8% in Les Herbiers, 24.4% in Montaigu, 24.4% in Les Essarts and 23.1% in Pouzauges. Balladur had also performed fairly well this region. The bocage is a Catholic region, which goes hand-in-hand with a strong centrist vote. Bayrou and the UDF is far more reflective of the traditional Catholic tradition electorate in France than Philippe de Villiers is. Bayrou (and Balladur)’s performances is made all the more impressive by the fact that Philippe de Villiers did best in these regions. In the bocage, he often placed second ahead of Royal. Bayrou also did well in the far less clerical (to say the least!) but “socially liberal” and moderate urban-suburban areas of La Roche-sur-Yon. He won 21.4% in La Roche and did even better in the city’s affluent northern suburbs: 26.3% in Mouilleron-le-Captif, 23.5% in Venansault, 25% in La Ferrière and 24.9% in Dompierre-sur-Yon. In some communes, such as Mouilleron-le-Captif, he placed second – but this time ahead of Sarkozy. In this urban area, Bayrou touched a new(er) electorate for the centre: a professional, urban, educated, young and middle-class electorate which is not solidly left-wing but where the traditional right (especially the Sarkozyst UMP) is not the preferred alternative. Bayrou did fairly well in the inland marais breton, but did poorly along the coast and in the left-wing plaine and marais. Coastal resort communities almost always favoured the RPR and Gaullists over the UDF. The UDF’s electorate in the inner west is usually a traditional, rural and Catholic vote. Resort towns do not have a natural inclination towards the UDF, but Balladur – not your typical UDF candidate – did well along the coast and in the resort communities. Then again, when it came to the wealthiest of right-wing voters, Balladur performed much better than Chirac in that “right-wing primary” of 1995. The Greens perform poorly in the Vendée: it is too rural, its urban areas are not large enough and not universally green-favourable and the coastal resort towns don’t like the Greens. In 2009, the Greens won 11.9%, placing third behind the PS (12.8%) and below its 16.3% national average. The Greens won 10.6%, against 13.6% in the region. The Green electorate was heavily urban. In 2009, the Greens won 19.6% in La Roche-sur-Yon and did well in the city’s commuter communities, especially those north of the city. Elsewhere, the Greens did well near Montaigu which increasingly part of Nantes-Clisson’s larger suburban influence. The Greens did equally as well in the southeast of the department which is by now part of Niort’s suburban belt. On the other hand, the Greens did very poorly in rural areas – bocage, marais and plaine alike – and also performed poorly along the coast (especially the wealthiest resort towns). The Greens’ environmental positions is hardly a good match to these focal points of baléarisation. It should not a shock to anyone that the Vendée is one of the PCF’s worst departments. Marie-George Buffet won 0.9% (and 1.9% nationally) and Robert Hue in 1995 won 4.8% (and 8.6% nationally). In 2009, the FG won only 2.7% in the department against 6.5% nationally. The PCF’s only relevant bases in the department are the left-wing areas of the marais and parts of the plaine. In 2009, the FG won 4.6% in Chaillé-les-Marais and 5.2% in L’Hermenault. It won 1.1% in Les Herbiers and Pouzauges. The PCF can also perform well in La Roche-sur-Yon proper (4.5% in 2009) and, amusingly, along the coast: 3.5% in the canton of Les Sables-d’Olonne, which had a PCF mayor between 1945 and 1947. This is most likely a core electorate made up of the few remaining fishermen in the towns along the coast. The Vendée was a bulwark of reaction to the republican regime until the 1910s or 1920s. André Siegfried had described, in the bocage at least, a reactionary department, a land of hierarchical structures and where the nobility and clergy exerted significant political influence. Politics was conceded to be the business of the aristocrats and nobles, who only used elective office to perpetuate their hierarchical control of the region through the acquiescence and support of the Catholic Church. Elective office at all levels was usually held by aristocrats or their pawns, and often passed down from father to son. He remarked that the landscape and political attitudes of the bocage had hardly budged since the days of the chouannerie. Between 1876 and the 1920s, the core monarchist base was found in the haut-bocage and the marais breton (Challans), the most reactionary regions and the heart of traditional Vendée. These two constituencies in the north of the department elected openly monarchist members between 1876 and 1914. By the 1880s and 1890s, being a monarchist became less fashionable and futile, leading most pragmatic conservatives to change their allegiances to one of défense catholique or even join the ranks of the republic through the ralliés (ALP). But in the Vendée, voters or rather their masters remained loyal to those die-hard reactionaries who remained loyal to the monarchy and the King until the very last day. The ALP elected only one deputy from the department, in 1914. Challans’ constituency elected a monarchist noble, Armand Léon de Baudry d’Asson, a reactionary anti-Semitic monarchist, between 1876 and 1914. His son Armand Charles served between 1914 and 1928. Other monarchist deputies, such as Paul Antoine Charles Bourgeois, often tended to be similarly reactionary and of noble blood. Republicans could hope to win more seats in what Siegfried called the élections d’appaisement where the blood wasn’t boiling on either side, where the issues were not as polarizing, when the government was popular and moderate, when nobody was alienated. 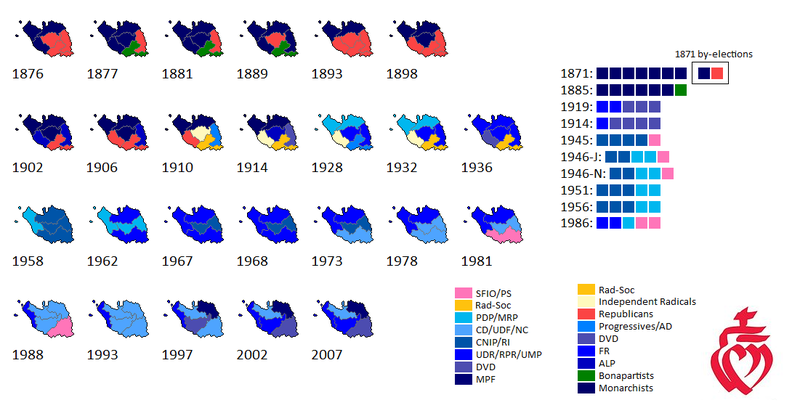 1881, 1893 and 1910 are examples of such elections. The right was usually demoralized, divided and unmotivated in those years. But in the élections de lutte, elections fought around a big issue which polarized the electorate, where the blood was boiling, when people hated each other’s guts and where the right was in a feisty combative mood against the godless republicans. 1876, 1877, 1885, 1898, 1902 and 1906 can be considered élections de lutte and the right invariably performed better as its mobilized its base (compare 1902 to 1893). The marais poitevin was a Bonpartist stronghold from the 1870s till the 1890s. The constituency covering most of the marais elected Alfred Le Roux, a cabinet minister under the Second Empire, in 1877 while his son Paul Le Roux held the seat between 1881 and 1893 before serving in the Senate between 1894 and 1923. André Siegfried had described the mood in the marais as fiercely independent, populist and attached to ‘la manière forte‘ (‘the hard way’, in a non-authoritarian way). But it was an anti-clerical, left-wing Bonapartism which morphed into republicanism and radicalism fairly easily though the Boulangists and nationalists (of the 1902-1910 era) had some successes. The same constituency would later return Radical members for most of the Third Republic’s final years. In 1936, the Radicals won in most of the plaine and marais while an independent right-leaning Radical was successful in his home base of Les Sables, at that point a republican region. The bocage elected four FR deputies, representatives of the Catholic right and the most conservative of the right’s two big parties. During the Fourth Republic and the early years of the Fifth Republic, the Vendée outside the handful of PCF or SFIO bases in the plaine, marais and La Roche was by and large a battleground between the two main factions of the French right: the Christian democrats of the MRP, locally represented by Lionel de Tinguy (deputy 1946-1958, 1962-1967) and Louis Michaud (deputy 1946-1967); and the family of the independents, “moderates” and so forth (the CNI), represented locally by Armand Quentin de Baudry d’Asson (grandson of the aforementioned monarchist, deputy from 1945 to 1958). The CNI has often been said to be the droite laïque as opposed to the Christian democrats, but there was nothing laïcard about Armand Quentin de Baudry d’Asson, the top cheerleader for Catholic private schools and often to the right of the MRP on such issues. Proportional representation allowed for the election of a SFIO member in 1945 and 1946, but the bulk of seats were divided between the independents and MRP. The two fought roughly an equal game in 1946, before Baudry d’Asson’s alliance with the Gaullists in 1951 carried him to a landslide. In 1958, the department elected three CNI members while Louis Michaud was elected in the coastal constituency, defeating Baudry d’Asson. In 1962, Lionel de Tinguy defeated a sitting CNI member in La Roche while the Gaullists, including Vincent Ansquer in Montaigu, defeated the two other CNI members. The situation stabilized for years in 1967, with the defeat of Lionel de Tinguy by the RI mayor of La Roche Paul Caillaud and Louis Michaud’s defeat by the Gaullist Pierre Mauger, mayor of Les Sables between 1965 and 1971. André Forens, the Gaullist mayor of Fontenay-le-Comte and later UDF member defeated a sitting UDR member in 1973 but in 1981 he was defeated by Pierre Métais, the first Socialist to win a seat in the department through the single-member electoral system. Philippe Mestre (UDF-PR) was able to succeed Paui Caillaud in La Roche, defeating the PS mayor of the city since 1977, Jacques Auxiette. Pierre Métais was able to win reelection fairly easily in a new fifth constituency in 1988, but once again it was only through strong support throughout the plaine and the marais’ cantons. The right, including Philippe de Villiers, parliamentarian since Vincent Ansquer’s death in 1987, held all other seats. By this time, the right was heavily dominated by the UDF, which elected Jean-Luc Préel in La Roche-Nord and reelected Philippe Mestre in La Roche-Sud. The RPR, with Pierre Mauger, held Les Sables, the old Gaullist fief. In 1993, Joël Sarlot (UDF) easily defeated the PS mayor of Fontenay in the fifth constituency. That same year, the RPR mayor of Les Sables since 1980, Louis Guédon, was elected in succession of Mauger. Sarlot was able to hang on by a much narrower in the vague rose of 1997. 1997 was otherwise marked by the election in La Roche-Sud of Dominique Caillaud, a UDF dissident backed by Philippe de Villiers’ ephemeral LDI. All sitting members were easily reelected in 2002 and 2007. Véronique Besse, the MPF general councillor for Les Herbiers, succeeded Philippe de Villiers in a 2004 by-election. Joël Sarlot’ 2007 election was annulled by the Constitutional Council and he was succeeded by Dominique Souchet in 2008. Hopefully this long post has gone a good way towards setting the facts straight and breaking the stereotypes and misconceptions about the Vendée, which is ultimately not as boring as its electoral record may indicate. Please indicate to me which departments you would like to see profiled next. Posted on March 3, 2012, in Electoral analysis, Regional analysis. Bookmark the permalink. 3 Comments. The Var, would be nice to see a transition from the left to the right? Also were the Monarchist deputies in this area “populist” in the sense of supporting certain social welfare legislation?